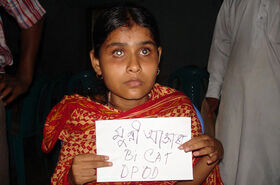 The Bangladesh childhood cataract campaign (BCCC) was based on the findings of research undertaken between 2001 and 2003 by ICEH, London which showed there are estimated to be 40,000 children who are blind in Bangladesh, approximately 1/3 of whom are blind from cataract. 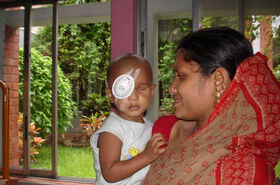 Control of cataract blindness in children is challenging as: 1. Communities and parents often do not know about childhood cataract and that it is treatable 2. Children often present very late to eye care facilities or they do not present at all 3. Surgical management is more complex than in adults, requiring expertise and additional equipment 4. Optical management is also more complex, and children require repeat refraction, spectacle provision and long term follow up 5. Visual outcomes can be compromised by amblyopia and other ocular abnormalities, and low vision care is often needed 6. Long-term complications, such as posterior capsule opacification, can occur. The overall aim of BCCC is to overcome these obstacles in order to reduce the childhood cataract backlog and leave in place services and systems which can manage the incidence or cataract blindness in children. This is estimated at 3-5/10,000 births = approximately 1,100 – 1,900 new bilaterally, congenitally cataract blind children each year. 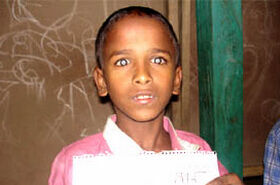 There are likely to be additional 2,200-3,800 children with bilateral developmental cataract per year. However, it has to be borne in mind that BCCC is a campaign the main aim of which is to reduce the childhood cataract backlog. 650 community trained voluntary group developed for childhood blind children identify by house to house survey. Specialist expertise in eye health and vision care. No. of 62 Screening camp held in every sub districts/districts for identifying the childhood blind children and avoidable blind. A database for childhood blindness analysis tool maintaining for childhood blind children which identified by the screening camp. Database developed by London school of Hygiene and tropical medicine – University of London. Partnership developed with the two eye hospitals for referring the cataract children and follow up of after cataract surgery. We have identified 4860 no. of childhood blind children and 380 no. 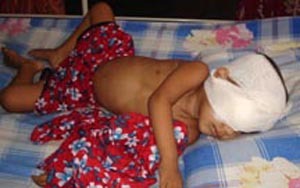 of cataract children (< 16 years) from the chittagong division including chittagong Hill Tracts. Confirmation of childhood blind and cataract by the screening camp which conducted by the ophthalmologist team. We have target 4621 no. of childhood blind children and 1541 no. of cataract was based on the findings of research undertaken between 2001 and 2003 by ICEH. A total no. of 887 cataract children identified by CEITC and BJAKS before YPSA begin the project. We have a partnership with blind school. Whose blind children want to admit into blind school, before start the new admission year YPSA organize screening camp in blind school. 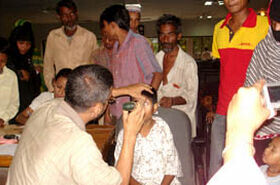 Ophthalmologist got three blind children (one female, two are male) last year (2007) who are cataract affected. 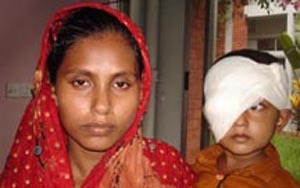 We referred them to the Chittagong Eye Infirmary and Training Complex (CEITC) for cataract surgery. After getting surgery the are now fine and going to normal school. Shahadat and Fazur Banu have only two children. Mehrab Hossain, 4 years and Sanjid akter, 1 year old. Their father Sahadat Hossain has a small grocery shop. They have no alternative source of income. Fazur Banu is a house wife. They are living from hard line with their small earning. 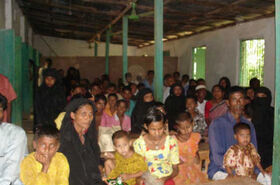 Few days ago, before coming in the screening camp their parents saw their children eye is changing. They do not give prevalence on it. They have no idea about on cataract and blindness and don’t take their children to the doctor. Neighbors seen their children’s eyes, sometimes they give them suggestion to go to the doctor. In Hatiya, YPSA has done screening camp. Volunteers identified childhood blind children by house to house visit. Volunteer saw their children’s eyes and they told them it may cause of cataract and suggested them to come to camp, eye specialist will see their full free and after seeing if children’s are cataract, the surgery cost and other medical faculties will be full free. Parents of Mehrab and sanjida hopefully that at least they will know what is in their children’s eye. 29 April 2008 they came in the screening camp, the ophthalmologist examine their eyes and the above two children’s are Bilateral cataract. We referred Mehrab and sanjida to CEITC for cataract surgery. They came to the CEITC on date 14 May 2008. They admitted hospital and operation done on 15 May 2008. Talked with their mother in the hospital and she told God will cure their children’s and also they pray to almighty of Allah who identify their children’s and brought them in the hospital for betterment. Now they are waiting with their children’s both of them full cure and will come in a bright future.